Today we’d like to introduce you to William Black. My wife, sw! Stylist and site manager, Erica, introduced me to the hair-care profession through the lens of a cosmetologist in 1995. From new client acquisition to booth rent and towel care, lessons were learned. In addition, as a “regular” at a neighborhood barber and beauty shop, I was quickly acquainted with the operational and end-client aspects of the business. During this time, I learned a great deal. So, when I decided to enter into the business in 2009, I wanted to solve problems. Seemingly unbridled noise levels and unprofessionalism, coupled with environment and salon conditions and safety concerns were (and remain) hot button issues for both stylists and clients in several “affordable” Urban beauty shops in town. And, with a little idea simply called: “Sew What!” I set out to change that. Sew What! Salon Centre is my attempt to reconcile affordability and exclusivity. Posh and possible. And, eight (8) years later, we’re going stronger than ever– expanding our reach both creatively and demographically. Well, understanding my numbers and reevaluating my “Break-even Analysis” as change happens and expenditures fluctuate has assisted me greatly in preemptively addressing fiscal challenges and related obstacles when they arise. Sew What! Salon Centre is a professionally-operated hair salon and styling center. We understand the importance of managed hair-care and the relationship between a great appearance, a great attitude and a great price. This is why we are affectionately known to clients as their “trusted home for all things hair!” We proudly serve over 180 clients per week and our collective client-base spans multiple ethnicities African-American, Latino, Caucasian), ages (5years to 85years), demographics and distances with clients traveling from as far as Elgin, IL. (Statewide) and Brooklyn, New York for their respective hair-care needs. Although, we offer an extensive array of services, including: Stylish Cuts and Color Treatments, Natural Hair Styles, Overlays, Relaxers, Up-Do’s and Wash-N-Sets; Feeding and Box Braids, Eyelash installs, Eyebrow Design, Twists, Crochets, Children’s Styles and dozens of other styles and services, our specialty is in the name: “Sew” What! Our widely-regarded sew-in applications range from full, partial and lace front sew-ins to the uber-exclusive braidless application. In summation, I am most proud of our team. 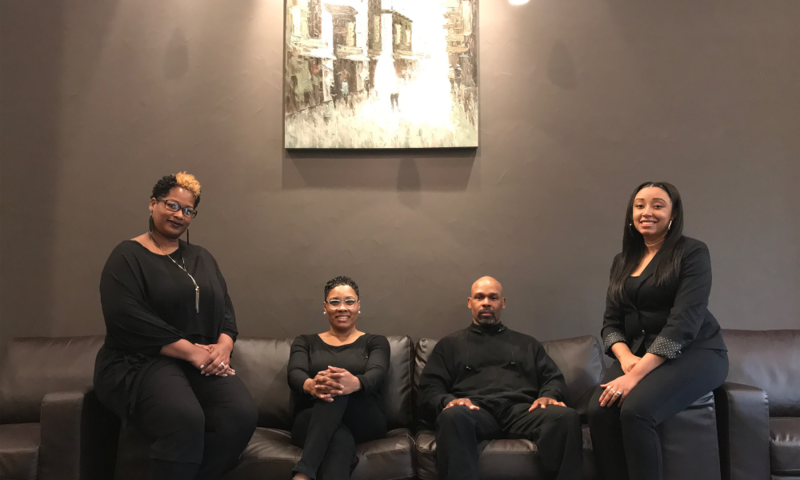 Our success is because of them: Erica Black, Sheintia Williams, Tiara Bankhead, Stacy Lee and Reggie “The Hair Doctor” James. Their commitment to each other and providing the best experience at the best possible price is not only what I’m most proud of, it is also what sets us apart from the others. We literally and figuratively offer our clients more for less. Yes, I believe Chicago is a wonderful and innovative place for hair-care hopefuls and creatives. The city is chock-full of inspiration to create and the climate is ripe for success. In an effort to improve: I would like to see more salons take a page or two from my approach: give to get. Create an upscale and professional work environment where clients want to come and stylists want to work. Fun facts: Although, we do not take walk-ins in a traditional sense, we maintain a steady (over)flow of new client calls and emails per week and we literally have a waiting list of stylists looking to work in our space if a station ever becomes available. With services starting as low as $15, and our trained professionals being mastered in an extensive array of hair styles and ethnic textures, we have something for everyone! Senior Swag: You and your BFF (or Bestie) 55years or older collectively qualify for our Buy One ($55) Get One Wash-N-Set absolutely FREE! Sew, be sure to bring the Lucky Lady along with you for your appointment. Address: Sew What! Salon Centre. Client of Erica for over 20 years, absolutely love her and her husband for all they do for their clients and for providing an atmosphere where you feel safe, appreciated, and always always always leave their establishment feeling and looking your absolute best!!!!! !